Inspired by words from writer Hugh Prather, "Always a new painting, always a new me," my paintings are a celebration of my ever-evolving artistic expression. 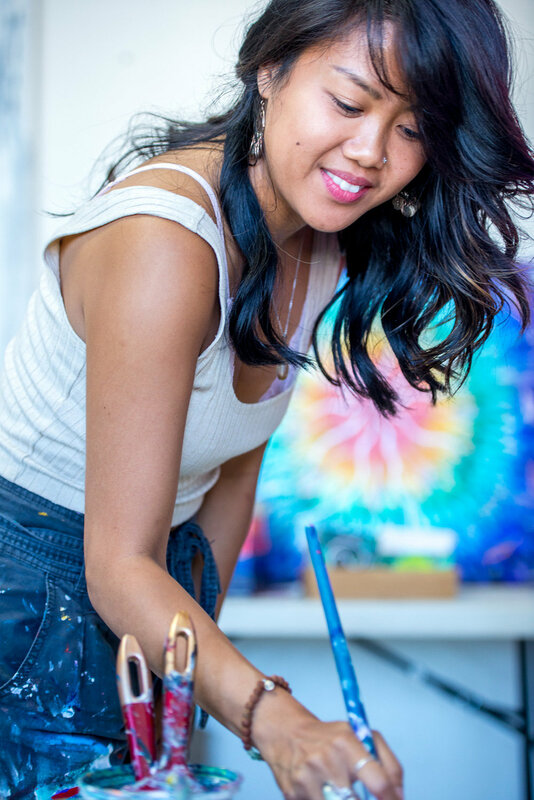 Art was always part of my life growing up but I struggled to find a fulfilling practice after graduating from Emily Carr University in 2007 with a Bachelor of Visual Arts. It was then I decided to embark on a year-long journey of self-discovery around the world with a backpack and yoga mat. It was in Rishikesh, India where I immersed myself in the ancient philosophies and practices of yoga, completing my teacher training certification. But it was a spiritual experience in Hawaii that was the turning point for me. On the Big Island of Hawaii, I lived in a retreat village where I learned the power of surrounding yourself with a positive and supportive community. After a reiki energy reading, I received a red flower from my healer. I had no idea what the intention on the flower was but felt the need to paint the beauty of it. That one flower was what inspired me to paint again and was the beginning of an entirely new series and style of paintings. Furthering my passion for creative expression, I followed my heart and studied at the Vancouver Art Therapy Institute to obtain a diploma in Art Therapy. Today, I combine all of my inspirations from painting, meditation, and yoga to bring the gift of Art Therapy to my community. I wholeheartedly believe in the healing power of art, and that everyone is creative once we let go of our inner critic and boldly open up to embracing our truest self. I always begin with a ritual of burning sage or incense. Working layer by layer, alternating between foreground and background, I listen to my intuition to guide the next stroke of my brush. When I paint I imagine my heart chakra opening and channelling it all into the canvas - from my heart, to the brush and to the canvas. I want my paintings to evoke positive energy and bring joy to the space and people around me. Click to hear my journey as an artist!